Aiden loves his electronics and would spend every waking minute on them. I was very excited to check out the unGlue app and see if it helped with some of our problems. I loaded the app on my phone and Aiden's iPod but had a little trouble getting it on my iPad. We used it on the iPod for a couple of days and Aiden was actually excited about his time running out and having to earn more time. He thought that was pretty cool. In the past week, he has unloaded the dishwasher, put away his laundry, emptied the trash, feed Bolt and let him outside. These are things he usually does but I have to ask him many times to do them. It's been nice that he has done them without my reminding him. We finally did get it on the iPad and I was so glad because that is what he uses the most. I ended up having to delete it from the iPad because it was locking it at night when I needed to be able to use it. I'm sure when I have the time to sit down and mess with it, I can adjust to make it work for us. The app is very user friendly and we will continue to use it to balance Aiden's screen time. Parents Sigh With Relief When The Fight Over Screentime Is Over Los Angeles, CA (January 16, 2017) -- When we were kids, finishing all your homework or cleaning up your room might be rewarded with a whole hour to play outside with friends or some allowance money! Today’s wired kids may be enticed to bring down the dirty laundry and set the dinner table with the prize of precisely 30 minutes of Internet access – to be used on their smartphone, tablet, or laptop. This teaches kids that time is money. That’s because mom or dad can now completely control a child’s time and access on the Internet with a clever service, appropriately called, unGlue. There is no denying that children have been glued to their screens for some time. The simple-to-use service works across all devices including smartphones, tablets and computers without the need to install anything on any device! It also works whether kids are home or on the go. Parents create Internet schedules for each child (for example: Olivia can use the Internet between 6am and 10pm). Then, within those schedules, mom or dad can limit the amount of minutes each child can spend on videos, social media, and games each day. unGlue coins it “Entertainment Time.” When they run out of Entertainment Time, they can still access the Internet, do homework, listen to music, and check the weather. They just can’t watch anymore cat videos or chat until the next day. The American Academy of Pediatrics (AAP) “recommends that parents and caregivers develop a family media plan that takes into account the health, education and entertainment needs of each child”. 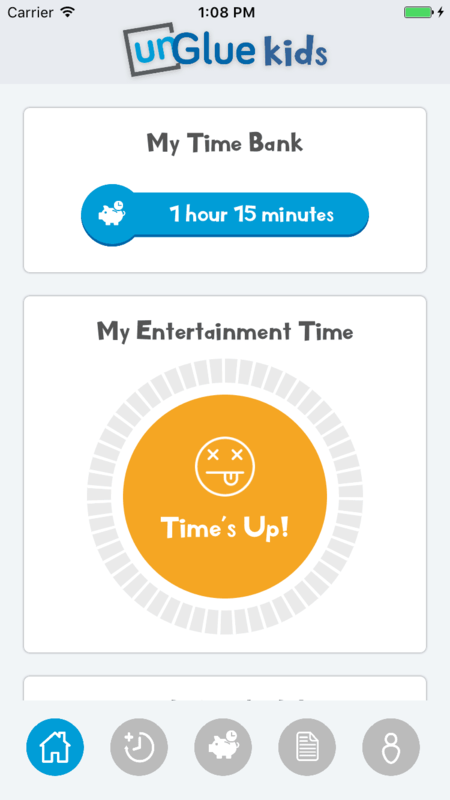 unGlue provides parents with this media plan via internet schedules, Entertainment Time limits, Chores, and Time Bank. Targeted at kids ages 6 and up, unGlue is free (for now) and can monitor any iOS or Android mobile devices, and any number of WiFi home devices such as computers, tablets, game consoles, and so on. To get started parents can download the unGlue app from the App Store. Android support is coming in February 2017. To support WiFi devices at home, parents have the choice of downloading the unGlue Home Monitor software onto a single desktop computer (hardwired, not a laptop) to control all devices at home. 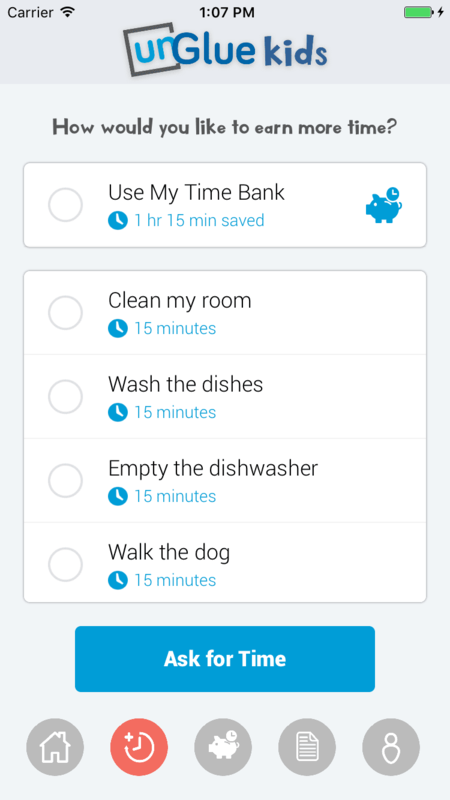 If families don’t have a computer with a permanent Internet wire connection, the unGlue Puck can be purchased for $30 through the app during the setup process. unGlue Is A Win-Win The benefits to parents are obvious but kids will appreciate the lesson to be learned – screen time is a precious commodity. Knowing that each day offers a limited window of Internet access, unGlue lets kids treat it like cash! 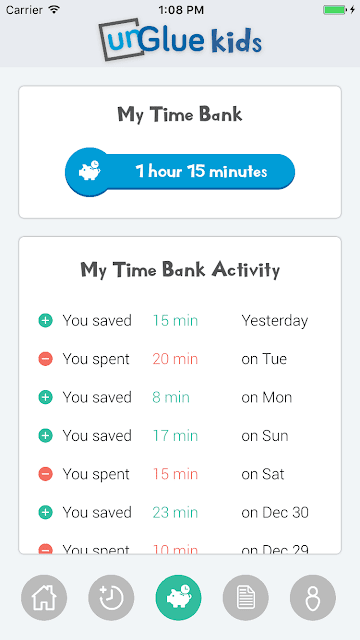 Instead of a penny saved, it’s a minute saved becomes a minute earned. 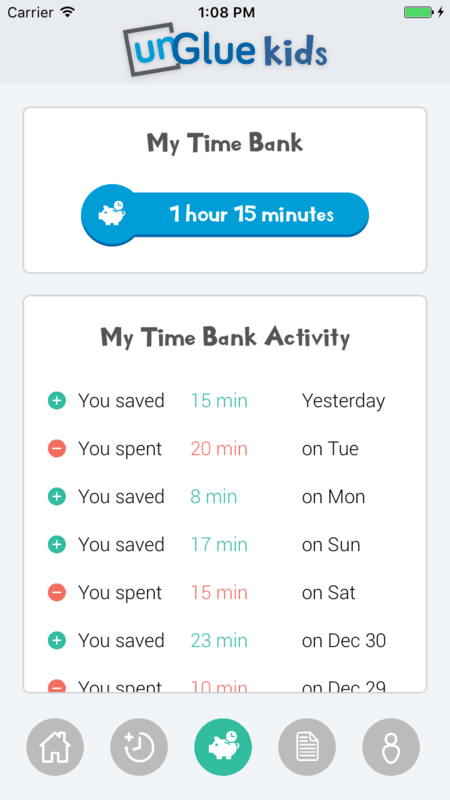 The App gently encourages better habits by allowing tweens and teens to save unused screen time for later and use it (withdraw) more time if they need to, up to the parents predefined limit. As their website points out, “suddenly, watching one more YouTube video just doesn’t seem worth it.” Now they might get to sleep soundly, without their cell phone sharing the pillow! 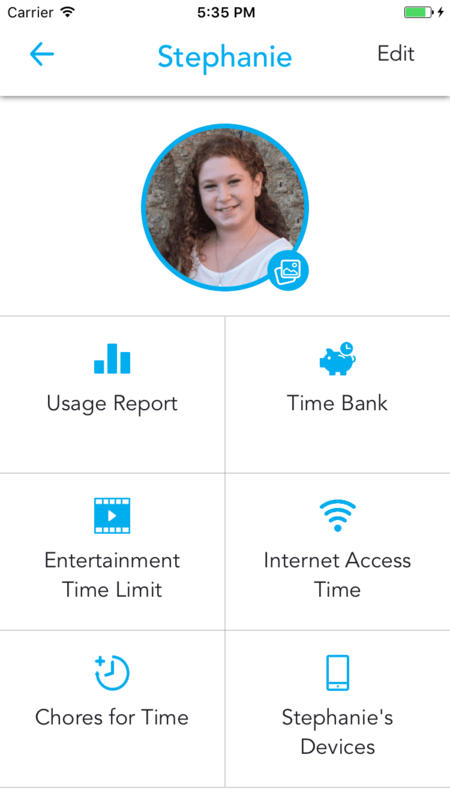 Moms and dads can give the gift of allowing children in elementary and middle school to manage their own digital time. 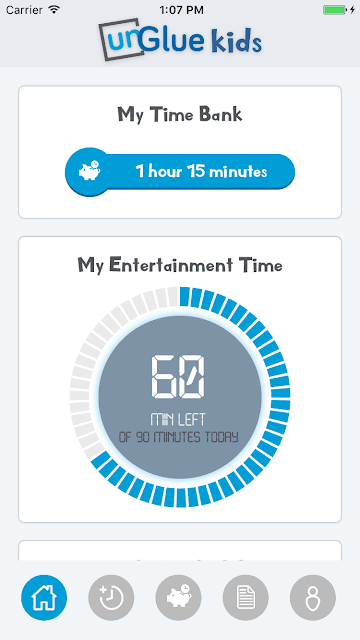 With unGlue’s predetermined screen time, kids have the flexibility to use their allotted time as they wish! The service shows them a chart of their time spent and time left so they control how much longer to play, to watch or to chat online. Parents discover what unGlue’s founders already know… the best habits are taught, not forced. Parents may use unGlue as a digital carrot-and-stick system to complete chores, finish homework or improve on last week’s math test. Kids can earn more screen time by doing tasks parents select for them. Write sincere thank you notes to relatives after a birthday and earn an hour of digital fun. Or lose the opportunity by forgetting to take out the trash and miss out on an extra 15 minutes of Xbox. unGlue Offers Peace of Mind Because kids’ digital activities can’t be monitored every minute, unGlue adds a comfort factor to parents. They can clearly see how long is spent on each website plus unGlue blocks access to the many unsafe websites. If a child wanders to an inappropriate site, the parent can receive alerts. It’s all in the App! unGlue works across any device in home or on the go and will ‘attach’ to new devices as they join the home network, automatically! Got a tablet or Xbox for a birthday present? unGlue knows it as soon as the child switches it on! 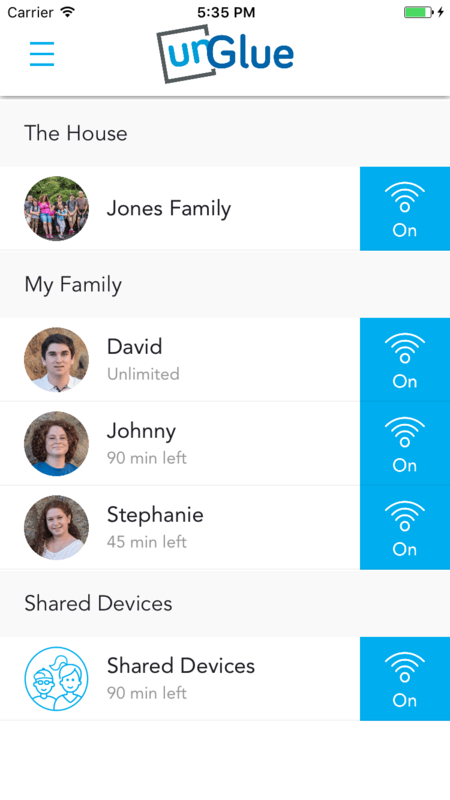 Kids’ friends join the home’s WiFi? unGlue lets parents define rules for them as well. 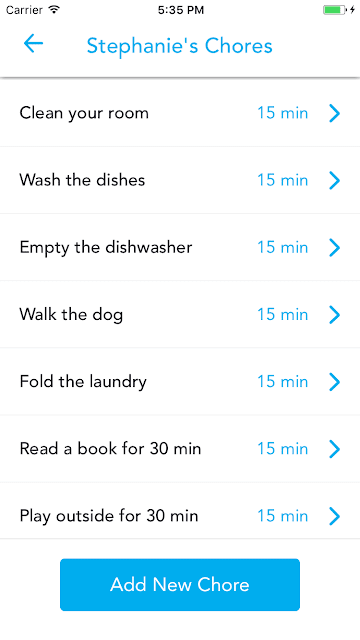 With the single goal in mind, unGlue helps parents control the amount of time their children spend across ALL of their electronic devices, at home or phones. Once the child is unglued from their digital world, they are free to go ride a bike, spend quality time with mom or read a book (!) for pure pleasure. About unGlue unGlue was founded in 2014 by Alon Shwartz and Alex Zherdev, two fathers who were tired of feeling helpless about what and how much content their kids consume online. Not only did they worry about their kids’ cognitive development and Internet safety, they were tired of the turmoil sparked by confiscating their children’s devices. The fact was, their kids couldn’t help themselves. Videos, games, and social media are designed to be addictive. They didn’t just want to control their kids’ online behavior -- they wanted to transform it. Parents needed more than just online content blockers. They needed to feel confident their kids were prepared to handle a future with more technology, more screen time and more distractions. unGlue teaches the good habit of optimal yet limited screen within the boundaries defined by parents. Find the App on iTunes and Google Play stores. Head over to the unGlue webpage to see if this is something your family can use. You can also connect with them on Facebook and Twitter. Special thanks to my friends at unGlue for allowing me to use this app and share with all of you. I hope it helps your family as much as it is helping mine! They will necessary to sense self-confident their particular youngsters have been willing to deal with another with an increase of engineering, a lot more display screen moment plus more disruptions. un Glue instructs the nice practice regarding ideal but constrained display screen inside limits identified simply by mom and dad.Thanks for sharing. This app is great but bc of the connection my kids can't do works sharing in minecraft while it's on. Anyone know how to get around this in the app?